The study design is a prospective, case-control. The aim of this study was to develop a reliable measurement technique for the assessment of lumbar spine kinematics using digital video fluoroscopy in a group of patients with low back pain (LBP) and a control group. 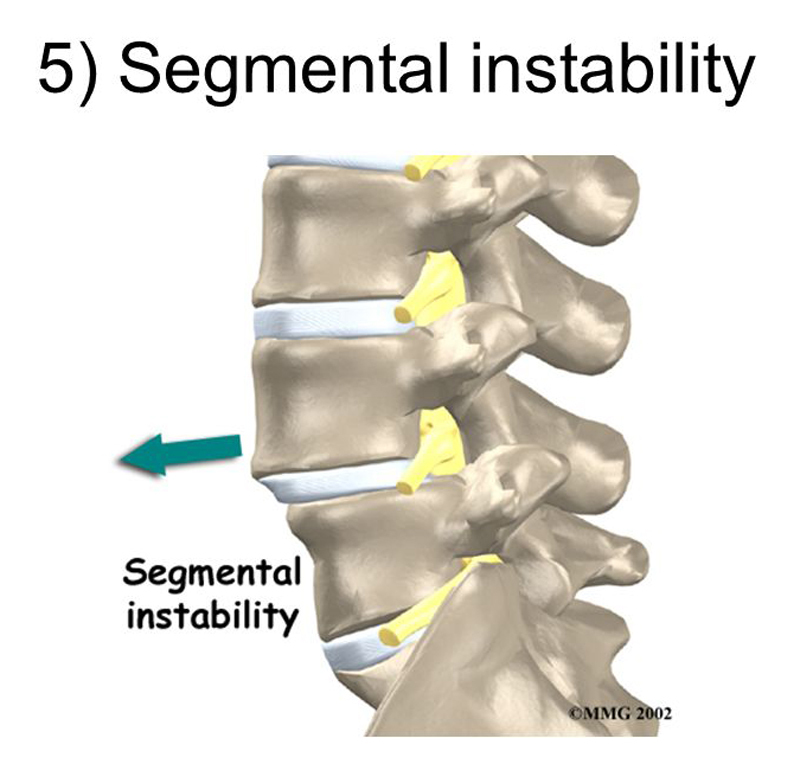 Lumbar segmental instability (LSI) is one subgroup of nonspecific LBP the diagnosis of which has not been clarified. The diagnosis of LSI has traditionally relied on the use of lateral functional (flexion-extension) radiographs but use of this method has proven unsatisfactory. Fifteen patients with chronic low back pain suspected to have LSI and 15 matched healthy subjects were recruited. Pulsed digital videofluoroscopy was used to investigate kinematics of lumbar motion segments during flexion and extension movements in vivo. Intersegmental linear translation and angular displacement, and pathway of instantaneous center of rotation (PICR) were calculated for each lumbar motion segment. Movement pattern of lumbar spine between two groups and during the full sagittal plane range of motion were analyzed using ANOVA with repeated measures design. Intersegmental linear translation was significantly higher in patients during both flexion and extension movements at L5-S1 segment (p < 0.05). Arc length of PICR was significantly higher in patients for L1-L2 and L5-S1 motion segments during extension movement (p < 0.05). This study determined some kinematic differences between two groups during the full range of lumbar spine. Devices, such as digital videofluoroscopy can assist in identifying better criteria for diagnosis of LSI in otherwise nonspecific low back pain patients in hope of providing more specific treatment. Low back pain is one of the most common problems in industrialized countries and its direct and indirect cost is enormous. Nearly 80% of people over the age of 30 will experience back problems during some periods of their life . Eighty five percent of this population is classified as having ‘nonspecific low back pain’ which contains little specific therapeutic and diagnostic information and refers to a large heterogeneous group of patients suffering from a variety of pathological or pathophysiological conditions . Despite the increased recognition of lumbar segmental instability (LSI) as an identifiable subgroup within this population [3–5], the identification of reliable and valid clinical diagnostic tools has thus far been elusive . The diagnostic standard for LSI has traditionally centered on identifying excessive translational or rotational movements between lumbar vertebrae by using functional (flexion–extension) radiographs [6–19]. There may be other factors as well, such as neuromuscular control of spinal movement and aberrant or abnormal midrange motion characteristics. Pathway of instantaneous center of rotation (PICR) may be affected in presence of segmental instability [20, 21] which has not been considered in vivo for LSI patients. Therefore, it is imperative that for assessing some disorders, such as LSI both quantitative and qualitative characteristics of movement should be considered. Traditional radiographic assessment has some limitations, such as large variation, being based on static postures at extreme ranges of motion and associated large measurement errors [7, 22–27]. Therefore, there is a need for tools to assess kinematics in vivo in order to measure the motion characteristics in midrange, where aberrant motion and dysfunction have been postulated to occur, based on neutral zone concept put forth by Panjabi et al. [28, 29]. Digital video fluoroscopy (DVF) has been suggested as a tool for reliably evaluating normal and abnormal lumbar motions in vivo [1, 27, 30–35] and it seems that DVF is capable of identifying functional abnormalities in patients with LSI who have no structural abnormalities detectable by X-ray. Hence, the aim of this study was to develop a reliable measurement technique that would allow for the assessment of sagittal plane lumbar spine kinematics using digital video fluoroscopy in a group of patients diagnosed having LSI and a control group.